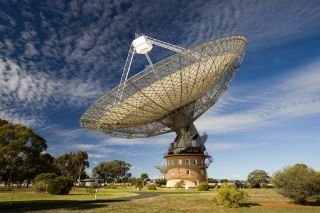 The CSIRO Parkes radio telescope will listen for intelligent alien life with the help of new hardware advancements. Breakthrough Listen, a $100 million project designed to seek out potential signals from intelligent extraterrestrial life, took a giant leap forward Monday (May 7) with a new campaign to search for life in the cosmos faster than ever before. Using the Parkes radio telescope in New South Wales, Australia, Breakthrough Listen will scan millions of stars in the Milky Way's galactic plane over the next 60 days. This will allow researchers to survey a greater area of the galaxy more quickly, which will increase their chances of finding signals of interest. An illustration of 'Oumuamua, our solar system's first observed interstellar visitor. Breakthrough Listen was unable to find evidence of extraterrestrial life aboard the rocky traveler. "With these new capabilities we are scanning our galaxy in unprecedented detail," Parkes project scientist Danny Price of the University of California, Berkeley, said in the statement." By trawling through these huge datasets for signatures of technological civilizations, we hope to uncover evidence that our planet, among the hundreds of billions in our galaxy, is not the only where intelligent life has arisen." The Breakthrough Listen initiative was started in 2016 by entrepreneur Yuri Milner and astrophysicist Stephen Hawking (who died in March) to use instruments like the Parkes radio telescope to survey the Milky Way's galactic plane, along with nearby galaxies. The initiative's main goal is to find evidence of intelligent, technologically capable life beyond Earth. Using radio surveys with instruments like Parkes, scientists aim to distinguish between human-made signals and "signals of interest," or signals whose origins could be extraterrestrial. The new Parkes campaign will continue Breakthrough Listen's search at a whopping 130 gigabits per second — bandwidth that your laptop could only dream about. In addition to increasing the speed and scope of the search, the new multibeam receiverwill also give scientists the ability to better distinguish between signals of interest and human-made signals, such as radio interference from airplanes, cellphones and satellites. During the new 60-day campaign, the Parkes telescope will spend 1,500 hours listening for extraterrestrial signals. Scientists will then sift through the resulting mountain of data for any true signals. Most of the signals observed will be human-created radio frequency interference (RFI), or signals from technologies like cellphones, satellites, and airplanes, but scientists are hoping that within this sea of data lie signals of interest, according to Breakthrough Listen. Researchers are especially interested in locating fast radio bursts (FRBs). These quick and vibrant radio pulses have intrigued scientists for years, as they are both unusual and certainly extragalactic. FRBs have mysterious, far-off origins — the closest observed FRB was 1.6 billion light-years away. There is no evidence of the alien involvement in FRBs, but they do originate from sources with extremely powerful magnetic fields, according to Breakthrough Listen. Previously, Breakthrough Listen scientists listened for radio signals from 'Oumuamua (pronounced oh-MOO-ah-MOO-ah), the first interstellar object ever observed in our solar system. They did not detect any signals from the strangely shaped space rock, which looks like a giant cigar. Still, if there is intelligent life beaming signals from a nearby galaxy, or even our own, Breakthrough Listen aims to find them.